Both of these are sweet, delicate pies made with rich custard between crisp filo leaves. 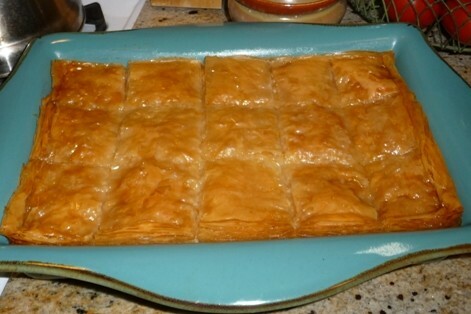 In most places in Greece it is known as Galactoboureko, while in Crete and in Northern Greece it is still called by its Turkish name, Bougatsa. We have had both and the main difference that I can see is the first is drenched in hot sweet syrup as soon as it comes out of the oven and the second is heavily sprinkled with powdered sugar and cinnamon instead of syrup. My mother used to make this honey-drenched pita and it was sublime! 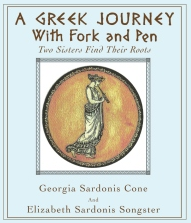 We have a recipe in our book, A Greek Journey With Fork and Pen, on page 30 called, “Mom’s Custard Baked in Filo with Honey”. I had never had Bougatsa until we went to Greece where it is a popular street food in many regions. The first time we had it was in Iraklion, the seaside capital and largest town on Crete. I will quote from our book, “Today Dan and I plan to visit the Palace of Knossos, but first we need a small snack. We walked to the main platia, which was shaded by trees and lined with tavernas and sweet pastry shops called zacharoplastias. As we approached we could see small tables shaded by colorful umbrellas, which match the awnings of the restaurants they belong to, randomly placed over the cobblestones. Floating on the breeze were the warm aromas of sugar and cinnamon beckoning to us. There behind the glass of a small stall we saw squares of custard pastry being warmed on the grill. Having never seen this before, we are told it is called Bougatsa, made with the flaky filo and filled with a heavenly, pale yellow custard. The cook dusted it with sugar and cinnamon and brought it to our table with two tiny cups of steaming Greek coffee. The taste of the silky smooth vanilla custard and crispy buttery filo was a combination that reminded us of our mom’s galactoboureko, the custard pie drenched in honey syrup.” The cook proceeded to tell us in the city of Thessaloniki in northern Greece there are coffee shops devoted exclusively to making and serving Bougatsa. That’s how popular this is!! So on page 136 we have a recipe for Bougatsa, which is just a little different from that of Galactoboureko. Since I had a special request for the recipe for Galactoboureko, that is what I am posting today. Combine all ingredients for syrup except honey making four equal rows lengthwise. and bring to a boil. Reduce heat and simmer for ten minutes. Remove lemon slices and cinnamon stick and stir in honey and blend. Allow syrup to cool. In a deep saucepan heat milk and farina, stirring constantly until it thickens and barely reaches a boiling point, being careful not to scorch it. Remove immediately from heat and cool five minutes. In a bowl, beat eggs and sugar until fluffy; add farina mixture. Add lemon zest and vanilla; blend well. Place 8 filo sheets in a buttered 9 x 13 inch baking pan, brushing each sheet generously with butter as you lay down each one. Allow filo to extend up the sides of the pan. Spread filling evenly over filo and fold overhanging filo over the filling and brush with butter. Cover with 8 more buttered filo sheets, which you have trimmed to fit the pan. With a sharp knife, score only through the top filo layers, making four equal rows lengthwise. Bake at 350 degrees F for 45 minutes until golden. Pour cold syrup evenly over hot pastry. Let stand 2 hours before serving. Cut into diamonds or squares. This pastry is best served the day it is made. Refrigerate any leftovers. This is truly a special treat. Savor it. See you next time….